Other winners included Alliance Coal's Warrior Coal Cardinal Team in the preshift competition, Kentucky Coal Academy's MCC Team in the Bench Biopak 240R category, and Revelation Energy's team from Kentucky in the Bench BG4 division testing. In first aid, Cliffs Natural Resources' Oak Grove Resources Oak Grove Blue Team was tops. Two winners were selected for each day of the mine rescue scenarios; Day 1 mine rescue winner was Drummond Co.'s Shoal Creek Red Team and Day 2 mine rescue top honors went to Alpha Natural Resources' southern West Virginia Team. Finally, in the combination mine res- cue/first aid contest, first place went to Mine Rescue Services' southeast Kentucky Team. A complete listing of all participating teams and winners can be found on page 25. 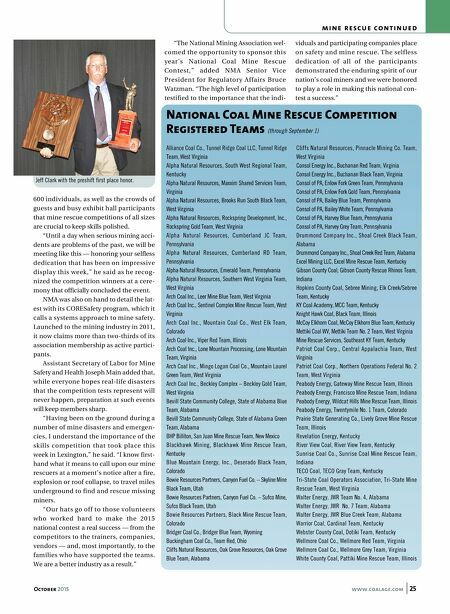 A complete wrapup of all teams' placements and times can be found at http://bit.ly/coal- rescue-results. Many of the participants are not new to the competition, which is sponsored b y t h e N a t i o n a l M i n i n g A s s o c i a t i o n ( N M A ) a n d j u d g e d b y t h e M i n e S a f e t y a n d H e a l t h A d m i n i s t r a t i o n ( M S H A ) , a t t e n d i n g r e g u l a r l y t h r o u g h o u t t h e i r mining careers. While the nationals have had many home venues, the first such competition was held in 1910 and is now the largest national competition of its kind. Also, the mining industry held its first regular mine rescue competitions in 1 9 1 1 , w i t h t h e i n a u g u r a l e v e n t t a k i n g place in Pittsburgh, Pennsylvania, as dig- nitary attendee President William Taft looked on. 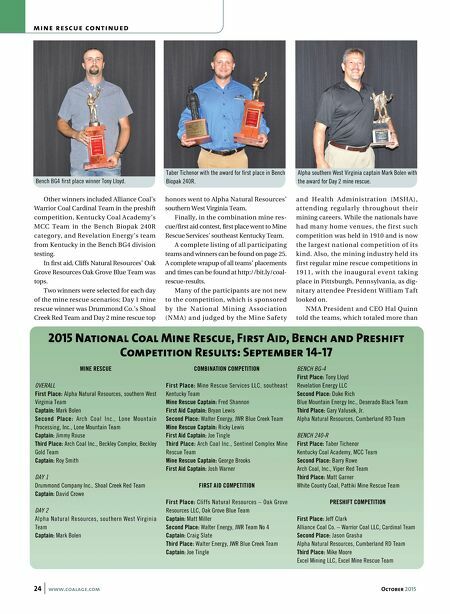 NMA President and CEO Hal Quinn told the teams, which totaled more than m i n e r e s c u e c o n t i n u e d 24 www.coalage.com October 2015 MINE RESCUE OVERALL First Place: Alpha Natural Resources, southern West Virginia Team Captain: Mark Bolen Second Place: Arch Coal Inc., Lone Mountain Processing, Inc., Lone Mountain Team Captain: Jimmy Rouse Third Place: Arch Coal Inc., Beckley Complex, Beckley Gold Team Captain: Roy Smith DAY 1 Drummond Company Inc., Shoal Creek Red Team Captain: David Crowe DAY 2 Alpha Natural Resources, southern West Virginia Team Captain: Mark Bolen COMBINATION COMPETITION First Place: Mine Rescue Services LLC, southeast Kentucky Team Mine Rescue Captain: Fred Shannon First Aid Captain: Bryan Lewis Second Place: Walter Energy, JWR Blue Creek Team Mine Rescue Captain: Ricky Lewis First Aid Captain: Joe Tingle Third Place: Arch Coal Inc., Sentinel Complex Mine Rescue Team Mine Rescue Captain: George Brooks First Aid Captain: Josh Warner FIRST AID COMPETITION First Place: Cliffs Natural Resources – Oak Grove Resources LLC, Oak Grove Blue Team Captain: Matt Miller Second Place: Walter Energy, JWR Team No 4 Captain: Craig Slate Third Place: Walter Energy, JWR Blue Creek Team Captain: Joe Tingle BENCH BG-4 First Place: Tony Lloyd Revelation Energy LLC Second Place: Duke Rich Blue Mountain Energy Inc., Deserado Black Team Third Place: Gary Valusek, Jr. Alpha Natural Resources, Cumberland RD Team BENCH 240-R First Place: Taber Tichenor Kentucky Coal Academy, MCC Team Second Place: Barry Rowe Arch Coal, Inc., Viper Red Team Third Place: Matt Garner White County Coal, Pattiki Mine Rescue Team PRESHIFT COMPETITION First Place: Jeff Clark Alliance Coal Co. – Warrior Coal LLC, Cardinal Team Second Place: Jason Grasha Alpha Natural Resources, Cumberland RD Team Third Place: Mike Moore Excel Mining LLC, Excel Mine Rescue Team 2015 National Coal Mine Rescue, First Aid, Bench and Preshift Competition Results: September 14-17 Bench BG4 first place winner Tony Lloyd. Taber Tichenor with the award for first place in Bench Biopak 240R. Alpha southern West Virginia captain Mark Bolen with the award for Day 2 mine rescue.